EL SEGUNDO, Calif.--(BUSINESS WIRE)--The revolutionary Beyond Burger® from plant-based leader, Beyond Meat®, has experienced explosive growth in recent months, mirroring a growing consumer trend around plant-based meats and better-for-you food options. In September, The Beyond Burger was selected as part of Sysco’s Cutting Edge Solutions program and since then, has been added to the menu at more than 2,000 new food service outlets including restaurants, hotels, college campuses and professional sports teams’ training camps. Many of these restaurants are innovative, single-unit restaurants like Delilah LA, The Moonlighter in Chicago, The Distillery NYC and The Hamilton Inn in Jersey City, that seek to appeal to meat eaters and vegetarians alike by offering innovative, plant-based options. Existing partners have also seen impressive growth since adding The Beyond Burger to their menus. 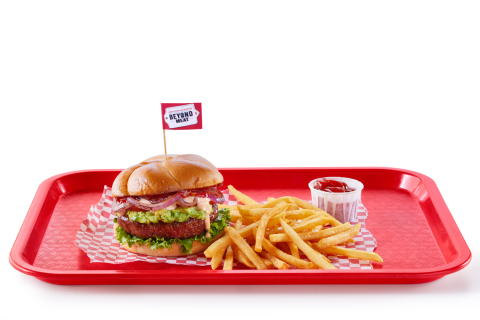 “In the first three months, we’ve sold more than 20,000 Beyond Burgers which equates to about 10% of burger/sandwich sales and is exceeding our sales expectations. Those numbers continue to grow each week,” said David Friedman, Founder & CEO of Epic Burger in meat-centric Chicago. Nationwide, The Beyond Burger is now available in more than 5,000 restaurants and grocery stores. BurgerFi: The first national burger concept to carry The Beyond Burger, BurgerFi is focused on sustainable, quality ingredients. BurgerFi offers both a vegan and non-vegan build to appeal to all consumer preferences at their more than 100 locations nationwide. iPic Theaters: The Beyond Burger is soft launching at the iPic’s Dallas, Austin, Houston and Chicago locations in late 2017, with an expected roll out to all 16 iPic locations in 2018. Twin Peaks Restaurant: Sports-focused Twin Peaks is satisfying hearty appetites by serving The Beyond Burger at their more than 80 locations nationwide. Beyond Meat’s rapid food service growth is coupled with major retail wins including Kroger and Albertsons Companies, the nations’ two largest grocery chains, carrying The Beyond Burger in the meat case. Most recently, Bristol Farms, Hy-Vee, Mariano’s, Raley’s and Stater Bros. joined the growing list of 3,000+ Beyond Burger retailers. For the latest list of stores carrying The Beyond Burger, visit The Beyond Meat blog. The Beyond Burger is the world's only burger that looks, cooks, and tastes like ground beef from cows but is made entirely from plants, without GMOs, soy, or gluten. The Beyond Burger packs more protein and iron than beef and is a cholesterol free food, with less saturated fat than beef. A 1/4lb Beyond Burger sold in restaurants has 8 grams of saturated fat and 22 grams of total fat, compared to 9 grams of saturated fat and 23 grams of total fat in a 1/4 lb 80/20 beef burger. Based in Los Angeles, California, Beyond Meat is a privately held company with a mission of building meat directly from plants. Investors include Bill Gates, actor and activist Leonardo DiCaprio, Twitter co-founders Biz Stone and Evan Williams, Kleiner Perkins, former McDonald's CEO Don Thompson, Honest Tea founder Seth Goldman, Humane Society of the United States, and Tyson Foods. To stay up to date on the latest, visit www.BeyondMeat.com and follow @BeyondMeat, #BeyondBurger and #FutureOfProtein on Facebook, Instagram and Twitter.